Years ago, when the IU Bloomington Libraries first started using Encoded Archival Description (EAD) to describe archival and manuscript collections, staff at the Lilly Library began to encode newly acquired collections in EAD. Other collections got EAD finding aids as time allowed. There were still descriptions of all the collections on the Lilly Library web site, even if they weren’t encoded in the modern standard. When the Lilly Library debuted its new request system in January 2016, the fact that more than 1,200 collections were not encoded in EAD became much more inconvenient. Library users can make requests directly from EAD finding aids; other requests had to be input manually. So, with the help of colleagues in the IUB Libraries Digital Collections Services (DCS) unit, we devised a plan of attack. Nick Homenda of DCS wrangled our web site data into a basic EAD template. Then a small team of graduate students and Lilly Library staff worked to expand those finding aids. We started with collections containing fewer than 100 items, in which an item could be a photograph, scrapbook, letter, or even a lock of hair. Drawing from both the web site’s (sometimes brief) descriptions and any relevant documentation in the library files – which might contain a preliminary inventory, or documents related to the acquisition, provenance, and organization of the collection itself – we described and encoded more than 700 finding aids over the past year, more than doubling the number of collections that are retrievable through the Lilly Library Request System. 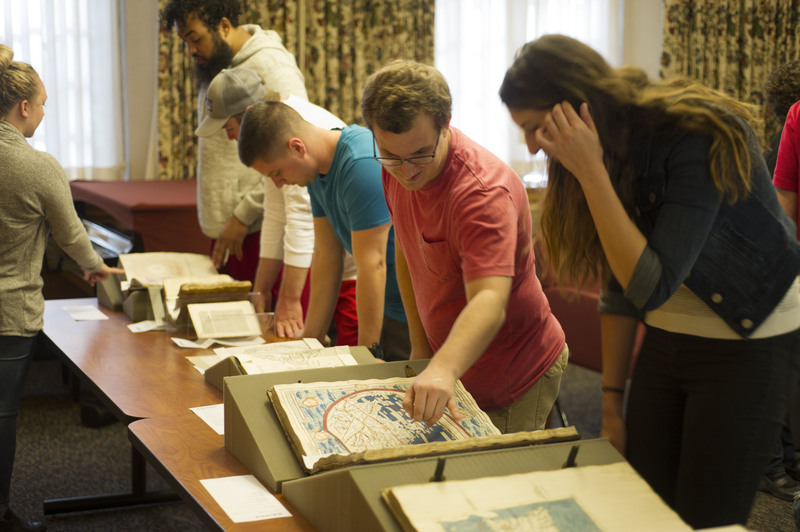 Explore the new collections in Archives Online at IU. While these are not new collections and, as with all Lilly Library manuscripts, have been open for research since their acquisition, the process of researching, examining, describing, and inventorying these collections has led us to rediscover several unique and intriguing collections. This project is far from over, but it seems like a good time to celebrate our progress and to thank everyone who has helped with the project so far: Madison Chartier, Haley Suby, Ava Dickerson, Nick Homenda, Mahaley Evans, John Henry Adams, Julie Hardesty, Craig Simpson, Erica Hayes, and Elizabeth Peters. Thank you!! Here’s one of the collections we have had since the 1990s. Now it is easier than ever to search and request! Look for more of our “rediscovered” collections on Instagram this summer! In April 1928, Professor Max Jessner embarked with eight German and eight Soviet medical researchers on a three-month expedition, officially dubbed the Soviet-German Syphilis Expedition, to Kul’skoe in the Buriat-Mongolian Autonomous Republic of the USSR. There, they hoped to study the syphilis epidemic ravaging the area, test the effectiveness of Salvarsan (an anti-syphilitic drug), and bolster political relations. The Jessner mss. 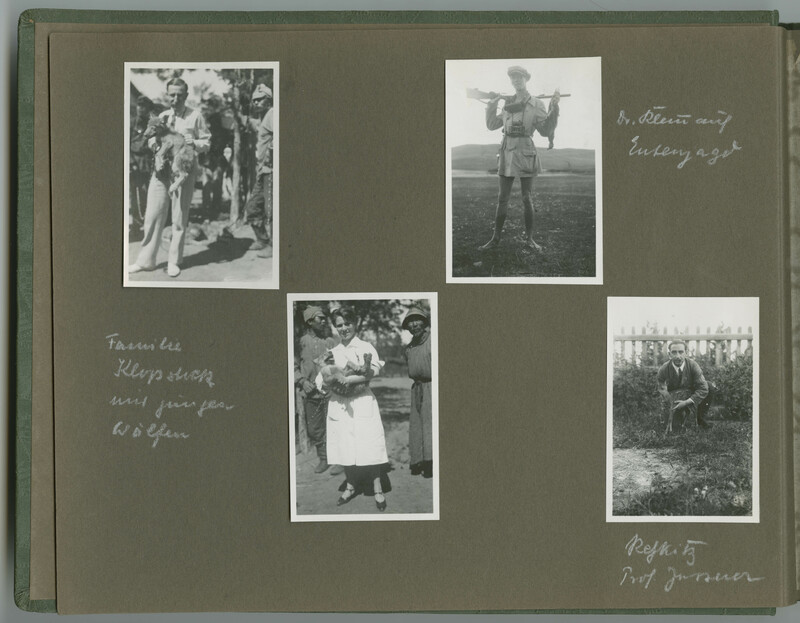 includes six albums of photographs depicting members of the expedition and Mongolian culture, most captioned in German. The quotation in the Sacco-Vanzetti Defence Committee bulletin. At first, the words were erroneously and emotively attributed to a speech Vanzetti had made in court. 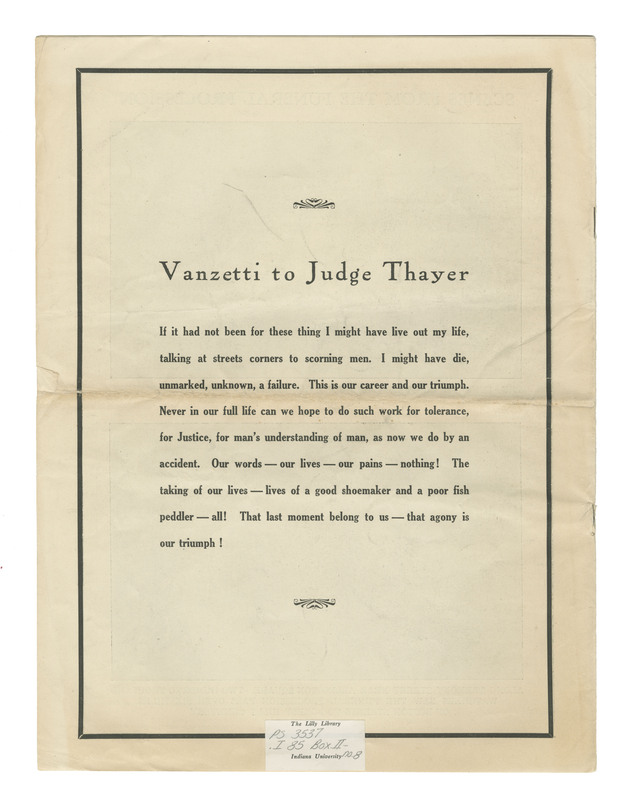 Publicity materials produced by the Sacco-Vanzetti Defence Committee, and the first edition of the prison letters, claimed he had said it to the Judge on the day the death sentence was pronounced. Its origins were in fact in an interview by the reporter Philip Stong who met with Sacco and Vanzetti at Dedham Jail in the spring of 1927. At the time, Stong claimed he had added nothing except exclamation marks. Despite this, scholars have taken the famous spiel with a pinch of salt (Russell, 1962: 388). Although Vanzetti was indubitably eloquent, there has been a general inkling that the statement must have been polished up for print. Tucked away in the Lilly Library archive is a fascinating letter by Philip Stong which breaks down, sentence by sentence, which words came verbatim from Vanzetti (or at least, were scribbled down fairly accurately in a hotel room later) and which had benefitted from journalistic fairy dust. Perhaps predictably, the most famous phrase of all – “a good shoemaker and a poor fishpeddler” – was a fiction. The letter, dated July 16, 1928, was written to the author Upton Sinclair who was researching a novel about the case. Having achieved fame with the muck-raking The Jungle back in 1906, Upton Sinclair had won good reviews for Oil! in 1927 and intended to cement his literary reputation with an ambitious “contemporary historical novel” about Sacco and Vanzetti (Sinclair, 1929: 5). Sinclair pestered everyone involved in the case for facts and insights. Phil Stong was responding to such a plea. It is notable that when younger writers wrote to Sinclair they often tried to impress him with their prose. Their missives, strewn throughout the Lilly Library’s Upton Sinclair collection, are littered with gaudy sentences, flattery and the swagger of swear words. Phil Stong’s letter, although in the same genre (he praises Sinclair as “a fine artist”), transcends this. As a writer, he clearly had talent to burn. It is hard to dislike someone who describes themselves thus: “I was 28 at the time, blondish but not blonde, German face, rather horsey but well-fed, six feet and a trifle plus, 194 pounds, well-groomed that day owing to being on an expense account.” Sinclair nabbed whole sentences from the letter for use in his novel, including the jokes. Phil Stong had visited Sacco and Vanzetti during a strange Indian summer of their imprisonment. Having been, after years of appeals, finally sentenced to death, they were allowed such luxuries as an hour a day playing bocce in the yard. During most of their imprisonment, the men had been in separate jails. For these few months, they were together in Dedham, a gaol made to sound rather picturesque by visiting writers. John Dos Passos described it as “airy, full of sunlight…a preposterous complicated canary cage” (Dos Passos, 1927: 69). Stong later reminisced that, “It is odd to speak of a prison as pleasant, but this one was” (Leighton, 1949: 185). During the interview, both the reporter and the two men were far too polite to mention the electric chair. The thought was ever-present nonetheless. Stong said that Vanzetti’s famous statement, or a version of it, was intended to comfort him. Philip Stong’s doodle of the jail floor plan during his meeting with Sacco and Vanzetti. Philip Stong to Upton Sinclair, letter dated July 16, 1928. “If it had not been for these thing,” says Vanzetti, “I might have live out my life, talking at street corners to scorning men. I might have died, unmarked, unknown, a failure.” (Note how he recalls himself from his personal determination and includes Sacco, now. I remember this distinctly.) “Now we are not a failure. This is our career and our triomph. Never in our full life can we hope to do such work for tolerance, for joostice, for man’s onderstanding of man, as we do by an accident. Then they shook hands and went back to their cells. 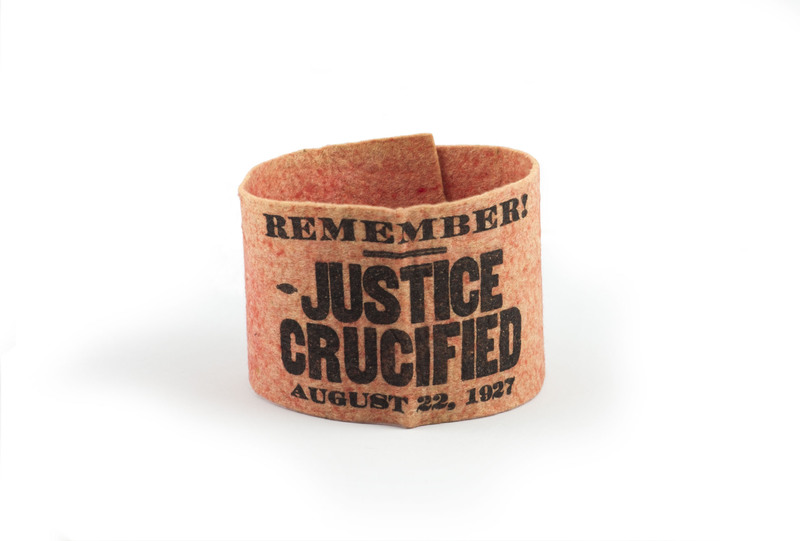 One of the red arm bands worn by mourners at Sacco and Vanzetti’s funeral. Katherine Reed is a History PhD student from the University of Manchester who took part in the John Rylands Research Institute/Lilly Library Doctoral Research and Training Program in 2017. Read more about the program here. Avrich, Paul. Sacco and Vanzetti: The Anarchist Background. Princeton, N.J.: Princeton University Press, 1991. Dos Passos, John. Facing the Chair. Boston: Sacco-Vanzetti Defence Committee, 1927. Leighton, Isabel, ed. The Aspirin Age 1919-1941. New York: Simon and Schuster, 1949. Russell, Francis. Tragedy in Dedham. London: Longmans, 1962. Sacco, Nicola and Bartolomeo Vanzetti. The Letters of Sacco & Vanzetti. London: Penguin Books, 1997. Sinclair, Upton. Boston. London: T. Werner Laurie Ltd., 1929. Tejada, Susan. In Search of Sacco and Vanzetti. Boston: Northeastern University Press, 2012. Everyone knows that the Lilly Library is home to countless wonders. From Shakespeare to Spider Man, our wide-ranging collections bring together materials from around the world and throughout the history of the written and printed word. Perhaps you’ve stopped by to see one of our exhibitions: medieval manuscripts, puzzles, vegetarianism, and books printed in India are just a few of the topics we’ve covered recently. Perhaps you’ve done research in the Reading Room for a class or a personal project. Maybe you’ve stopped in for a Friday tour or been to a class session or one of our special First Thursday presentations. Maybe you couldn’t resist asking us if you could take a selfie with our Academy Awards. We love all of our guests, from the casual visitor to our superfans. To celebrate IU Day, we put together some facts about the Lilly Library that may surprise you. There are no greater fans of the Lilly than the librarians who work here, and we enjoyed digging through our own archives to come up with these treats. 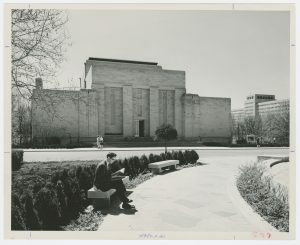 If you have memories of the Lilly Library that you would like to share, please post them on our Facebook page, tweet us, or comment on Instagram: @IULillyLibrary. 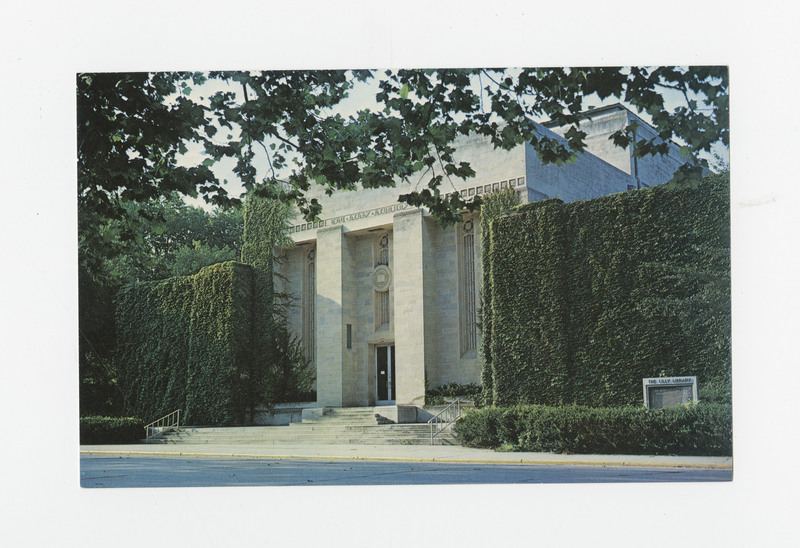 The exterior of the Lilly Library was once covered with ivy. The Lilly Library, covered in ivy. If you’ve been on campus for a few decades, you probably remember that the Lilly Library was once a bit more “Ivy League” than it is now. Although our collections still rival the Ivies, our building has been pruned. We’re not sure when the ivy was finally nixed, but we suspect the potential damage to the building played a role in giving the Lilly its current look, focusing on the beautiful Indiana limestone. One of the library’s vaults was once a bomb shelter. The vault on the first floor was once a designated Civil Defense shelter, in the event of an air raid. It’s certainly a frightening thought, but we can think of worse places to be trapped than among some of the most beautiful and interesting books ever printed. Tinned beans would taste great eaten over the Gutenberg Bible. 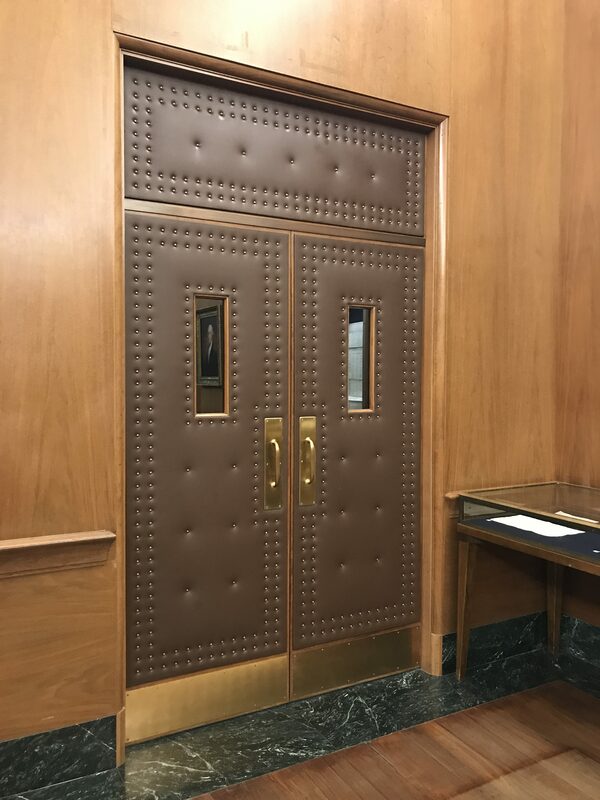 There is a set of doors in the Main Gallery that don’t go anywhere. If you’re reading this post, you’ve probably been in our Main Gallery at some point. Did you ever notice the mysterious set of doors with darkened windows? Did you ever wonder where they lead? As much as we would like to say they lead to a magical and hidden room, they lead… nowhere at all. The doors were added to the gallery to provide symmetry and balance to the room. The Lilly Library has three working fireplaces. The Lilly Library Ellison Room. 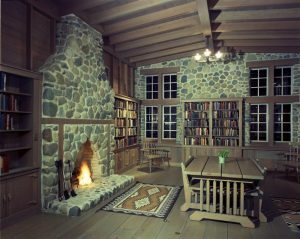 The Lilly Library’s Ellison Room, Ball Room, and Lilly Room all contain a fireplace. Many visitors have commented upon them, but few realize that these fireplaces do work. Although no current staff members have seen them blazing, there is photographic evidence that they have been used. It may seem odd to have fire so prominently featured in what is essentially a House of Paper, but the library’s designers were creating rooms which were splendid enough to house the collections they contained. In more recent years, the chimneys have been blocked to prevent the campus’s flying squirrels from finding their way into the building. Who knew that squirrels were such fans of great literature? Smoking was once permitted in the library’s Lounge. The Lounge (now the Slocum Puzzle Room). Note the ash trays! 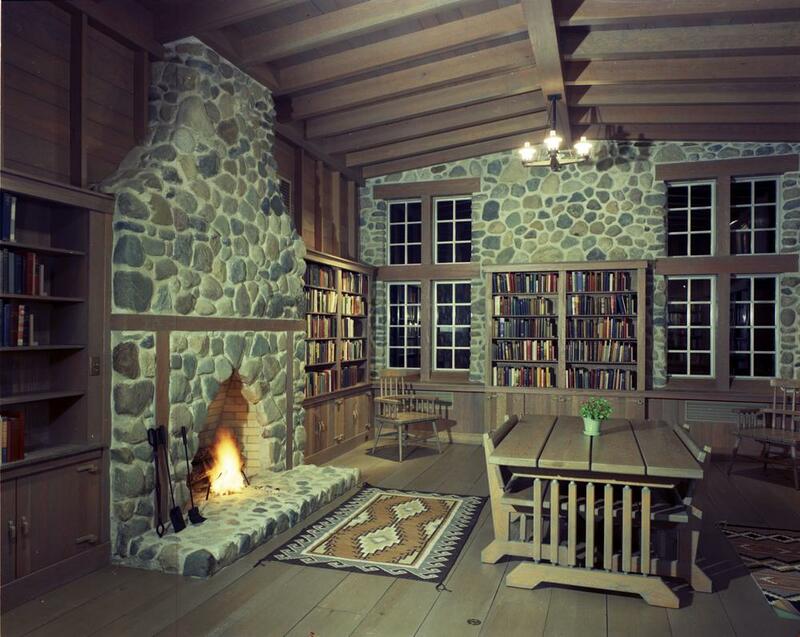 As with the fireplaces, it is difficult to believe that cigarette smoke would be allowed anywhere near rare books and manuscripts. 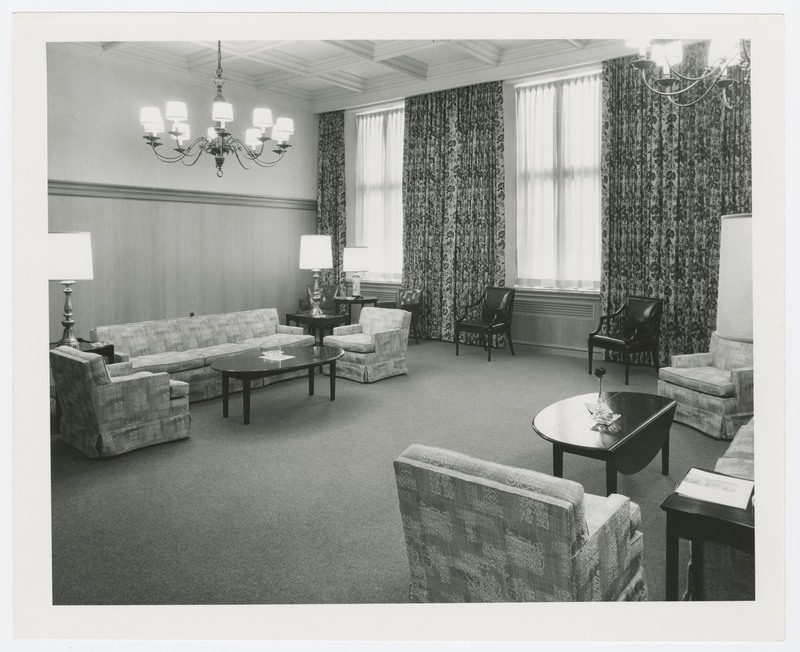 Smoking has always been prohibited in most of the library, but the Lounge (now the Slocum Room) was an exception; staff could smoke during breaks. There have been some famous visitors to the Lilly Library. The Lilly Library has been host to several dignitaries, celebrities, and other notable visitors. One of the most interesting visits was from three of the original “Munchkins” from the 1939 film version of The Wizard of Oz. Clarence Swensen, Myrna Swensen, and Donna Steward-Hardway (the youngest Munchkin to appear in the film) visited in conjunction with the library’s 2000 exhibition of our Oz-related collections. Although the exhibition opening event, which drew over 500 guests, was certainly memorable, we have been unable to locate any photographs of the Munchkins’ visit! 4. J.K. Lilly, Jr. only visited the Lilly Library twice. Herman B Wells and J.K. Lilly at the groundbreaking of the Lilly Library, March 7, 1958. 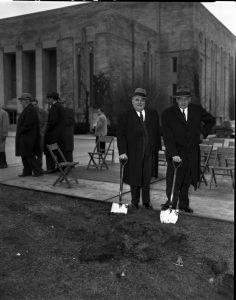 We still have the shovel held by Mr. Lilly in our collections! Of course the Lilly Library would not be possible without the generous donation of over 20,000 books and 18,000 manuscripts by J.K. Lilly, Jr. Mr. Lilly’s generosity was combined with the vision of Indiana University President Herman B Wells, who realized the need for a building to preserve the collection and make it available to students, faculty, and the community. Mr. Lilly later believed that the gift of the books was “the most satisfactory thing he ever did.” However, he only visited the site of the library twice, once upon the groundbreaking and once for the dedication. In many ways, this was Mr. Lilly’s final gift: he trusted the recipients of his marvelous collection to care for it and to nurture it into something much bigger. From 20,000 books and 18,000 manuscripts, we have grown to over 450,000 books and over 8.5 million pieces of manuscripts. And we hope that we have made Mr. Lilly proud. 3. A Lilly Library book was once exhibited in the Tower of London. Lilly Librarian David Randall brings Sir Walter Raleigh’s History of the World to London to go on exhibit in the Tower. There was once a car on exhibit inside the Lilly Library. This is the only photographic evidence we have of the car parked inside the Lilly Library in 1978! There are many strange objects in the library’s collections; we have Edgar Allen Poe’s hair, Tennyson’s pipes, and a life mask of Abraham Lincoln. But one thing we don’t have in our collection is an automobile. 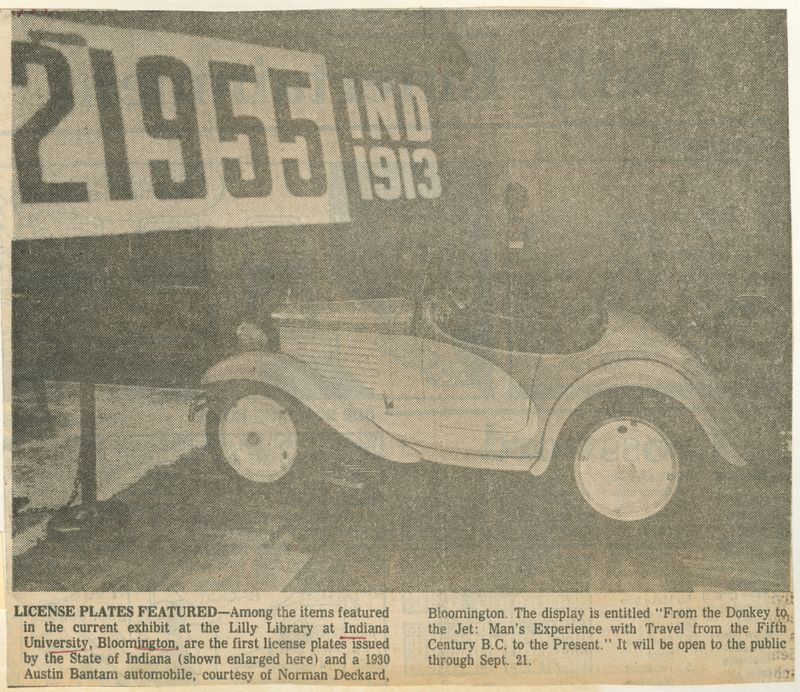 There was, however, a car exhibited inside the Lilly Library’s Lincoln Room in 1978. The car, a 1930 Austin Bantam, was loaned by Bloomington resident Norman Deckard for an exhibition titled “From the Donkey to the Jet: Man’s Experience with Travel from the Fifth Century B.C. to the Present.” A ramp was placed over the steps so that the car could be driven in through the front door. The Lilly Library has always been open to everyone. A recent class session at the Lilly Library. We have over 300 class sessions per year for undergraduates, graduate students, K-12, and community groups. With so many curious and fascinating items in our collections, there is no one person who has seen everything that we have. Visitors and researchers, as well as our own librarians, make exciting discoveries in our collections every week. The library is an organic, living entity combined from the collecting passions of the past and the forward-thinking caretakers, donors, and university administrators of the present. Visitors often ask us to reveal the “secrets” of the library, hoping perhaps for some dusty tome that has remained hidden from view. We have tried to reveal some lesser-known facts about the library in this blog post, but our greatest secret… is that we have no secrets! Our collections are available for anyone to research and enjoy. Stop by and see our exhibitions or contact us at liblilly@indiana.edu to make an appointment to use our Reading Room. If you enjoyed learning a bit more about the Lilly Library, make sure to follow us on Facebook, Twitter, and Instagram @IULillyLibrary. 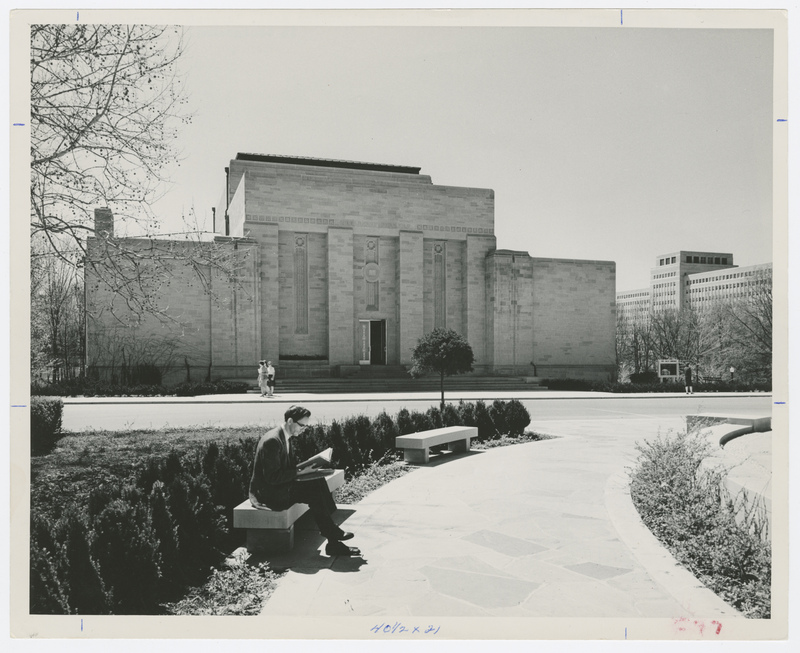 We’ll be posting #VintageLilly photos all day to celebrate IU Day and the Lilly Library! Tonight the PEN Center USA celebrates its 26th Annual Literary Awards in Beverly Hills, California. Congratulations to poet and translator Stephen Kessler, winner of the 2016 PEN Literary Award for Translation for the work, Forbidden Pleasures: New Selected Poems by Luis Cernuda. (Black Widow Press, April 2015.) The book is the most complete collection of the poetry of Spanish poet Luis Cernuda to appear in English. Kessler previously translated Cernuda’s prose poems, Written in Water (City Lights Books, 2004), and won the Harold Morton Landon Translation Award from the Academy of American Poets for his translation of Cernuda’s later poems, Desolation of the Chimera (White Pine Press, 2009). Luis Cernuda was a member of the Generation of 1927, a group of Spanish poets influenced by modernist movements such as Surrealism and Futurism. Leaving Spain after the fall of the Spanish republic, he taught for several years at Mount Holyoke College and then settled in Mexico in 1952. Stephen Kessler’s papers are part of the holdings of the Lilly Library. His collection is one of a growing number of collections documenting contemporary literary translation. PEN Center USA is a branch of PEN International, the world’s leading international literary and human rights organization. With over 60,000 comic books and graphic novels in our collection, there is no doubt that we at the Lilly Library are fans of comics! A new promotional spot featuring Indiana University alum, Media School professor of practice, and Lilly Library donor Michael Uslan provides a 30-second version of Mr. Uslan’s journey from a student reading comic books in his dorm room to the executive producer of the Batman films. You can watch the new video and also read about the Jacobs School’s role in providing the music on Inside IU Bloomington. You can also find out more about the comic book course that Michael Uslan taught at Indiana University on IU Archives’ blog. Since that 2005 exhibition, Michael Uslan has continued to donate comic books and graphic novels as well as his personal papers to the Lilly Library. We are proud to provide access to these collections to researchers from around the world and also to conduct class sessions in which professors from around campus bring their students to see and learn about the fantastic history of comic books. You can search our database of Uslan comics or contact our Reference Department at liblilly@indiana.edu to find out more about how to access this remarkable collection. Watch Us 3D Print a Death Mask! In May of 2016, the One Street Museum in Kiev, Ukraine contacted the Lilly Library about our Theodore Dreiser death mask. The One Street Museum has built an impressive collection of death masks—currently around 300—and they want to add Theodore Dreiser to that number. You can read more about this incredible and haunting collection here. Dreiser (1871-1945) was an author of literary naturalism, known for such novels as Sister Carrie (1900) and Jeannie Gerhardt (1911). 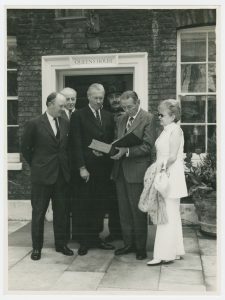 The Lilly Library holds several collections of Dreiser materials, including manuscripts, photographs, correspondence, printed materials—and the death mask. The traditional method of creating a copy of the mask involves using plaster to create a new mold and then casting a new mask from that. Obviously this would be a very messy process that could potentially damage the Lilly’s original, so we decided that a modern 3D print is a much more viable solution. We contacted Tassie Gniady, the Digital Humanities Cyberinfrastructure Manager with UITS (University Information Technology Services) Research Technologies to get information on how to have a 3D print created. Tassie reached out to Jeff Rogers, Principal Project Analyst & Team Lead at ICTC (Information and Communications Technology Complex), IUPUI for the 3D scan to be made. Jeff came to the Lilly and used a GoScan! 3D scanner to create the initial digital 3D model, which we then took to Andrew Webb, the 3D Lab Coordinator with UITS Technology Center Consulting. You can find out more about IU’s 3D printing services here. We ask that you enter a user name (whatever you want it to be) so that we’ll know how many unique viewers are watching. Then, depending upon your computer, operating system, browser, etc., you will basically be asked several questions about allowing your computer’s camera and microphone to be accessed or used. Just select “None” or “Deny” and continue. After a few moments, the live stream will appear. The entire print will take approximately 100 hours to complete. Below are photos of the initial scanning process with our original death mask. We’ve also included an image of the 3D model, which shows the support structures required for the print to be made. Those will be removed after the print is complete. 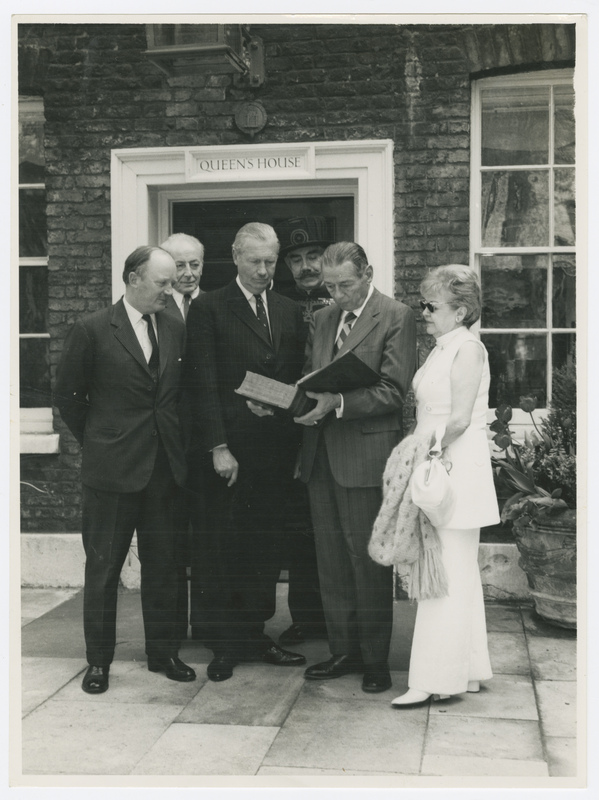 We’re so excited to share the grim visage of Mr. Dreiser with the other side of the world without the original mask ever leaving the building, and we’re excited about the potential for collaborative partnerships that use amazing modern technology to bring the past to life. Thank you Tassie Gniady, Jeff Rogers, and Andrew Webb for making this project possible! During the first week of May, Ms. Ellen Hsieh, an Everett Helm Visiting Fellowship recipient, and Dr. Christian Fischer, from the Cotsen Institute of Archaeology and the UCLA/Getty Conservation Program at UCLA, visited the Lilly Library to study the images of the Boxer Codex, one of the most important manuscripts in the Library’s collection. The Boxer Codex was supposedly made in Manila at the end of the sixteenth century during the early Spanish colonial period. It contains Spanish-language text and 95 pages of illustrations which are not influenced, apparently, by contemporary European artistic styles. The objective of the research was to analyze the coloring materials used in the different sections of the codex in order to study the nature and provenance of raw materials as well as the production process of the codex. Scientific analysis was conducted using portable X-ray fluorescence (pXRF) and fiber optics reflectance spectroscopy (FORS) in the visible and near-infrared. FORS spectra were collected with two spectrometers, a USB2000+ (Ocean Optics) operating in the visible and a UV-Vis-NIR Fieldspec 3 (ASDI, Panalytical), while pXRF qualitative data were obtained with a Niton XL3t GOLDD+ XRF analyzer (Thermo Fisher Scientific). These non-invasive technologies provide complementary information particularly useful for the identification of pigments and dyes, and have been successfully used to study other manuscripts from Europe and the Americas. Preliminary results show that the painter(s) of the Boxer Codex used both pigments and dyes such as azurite, cinnabar and indigo. However, precise identification of the whole palette and probable mixtures will require further in-depth analysis and interpretation of the collected data. The researchers are thankful for the financial support provided by the Lilly Library and the warm welcome and assistance from the librarians, conservators, and staff during their visit. Earlier this week, the IU Libraries and the National Recording Preservation Foundation announced a project to preserve, digitize, and make available online all the Orson Welles radio recordings held in the Lilly Library. It is the largest trove of Welles recordings in existence, and most are originals cut directly from the radio broadcasts as they aired. Experts from IU’s Media Digitization and Preservation Initiative will capture the audio from several hundred fragile lacquer discs and preserve it digitally to the highest standards. May 6 is the 101st anniversary of the birth of Orson Welles, so we thought a sneak preview of the project would be a great way to celebrate. We present today one episode of the Welles production Ceiling Unlimited. Sponsored by the Lockheed-Vega Aircraft Corporation, producers of the B-17 Flying Fortress bomber, the series focused on patriotic stories from the world of aviation. The fifteen minute episodes ran weekly from November 1942 to February 1943, and took a variety of forms. The first episode told the story of the B-17. Others dramatized real-life stories of aviators. Some episodes took a more imaginative turn. The recording shared here was broadcast on the first anniversary of the bombing of Pearl Harbor. It imagines a meeting in hell, convened by the Devil– played by Orson Welles, of course. Attending the meeting are four historical leaders who sought to conquer the world: Napoleon, Philip the II of Spain, Louis XIV, and Kaiser Wilhelm. They discuss Hitler’s efforts to do the same and consider the role of the airplane in wartime. Over the course of the coming year, look for more previews from our project, Orson Welles on the Air: Radio Recordings and Scripts, 1938-1946. In August 2017, the IU Libraries will be proud to host the most complete original source of audio for Orson Welles’s radio work, with the highest extant sound quality, presented in a web site rich in supplemental materials for exploring the work of this radio innovator. Happy “Bird-Day” to John James Audubon! J.K. Lilly, Jr.’s copy of the double elephant folio of John James Audubon’s Birds of America (1827-1838) is one of the most popular attractions at the Lilly Library today. Turning one page every week, it would take almost eight and a half years for us to feature all 435 beautiful hand-colored plates in the four volumes… and that’s just what we plan to do. Many visitors have enjoyed the birds over the years, and since we launched our Twitter account @IULillyLibrary last year, many fans all over the world have enjoyed our “Flipping the Bird” feature. But we’ve been pecking around the plates sporadically, featuring a big bird here and a small bird there. We showed off the spectacular Pink Flamingo in honor of John Waters’ visit to campus and even discovered a “lost” plate for some cheeky April Fool’s Day fun. But today, on what would be John James Audubon’s 231st birthday, we’ve turned back to Volume 1, Plate I—the Wild Turkey. And from now on, we’ll turn the page once a week in order until we see every duck, owl, songbird, and raptor. So whether you stop by our gallery every week or visit us virtually on Twitter, join us for the next eight years as we flip the bird and celebrate one of our favorite treasures! The Lilly Library is pleased to announce a $1.2 million gift by Walt Whitman Odets of a collection of more than 450 paintings by his father, Clifford Odets, the iconic American playwright, screenwriter, and director. Clifford Odets is best known as an influential playwright, screenwriter, and founding member of the Theater Group. The Lilly Library is already the home of an impressive archive of Odets’ written work, including extensive correspondence spanning his career, drafts of such landmark dramatic works as Clash by Night and Golden Boy, and drafts of screenplays of iconic films such as The Big Knife and The Sweet Smell of Success. Other drafts include films on which Odets worked that were later turned over to other writers, such as It’s a Wonderful Life. But Odets’ creativity was not limited to the written and spoken word, and the addition of his paintings to the Lilly Library’s collections continues a longtime interest on the part of the library in writers who are also artists, represented not only by our archival holdings of the writings and artworks of such luminaries as Sylvia Plath and Kurt Vonnegut, Jr., but also by our vast holdings in artists’ books and fine bindings. 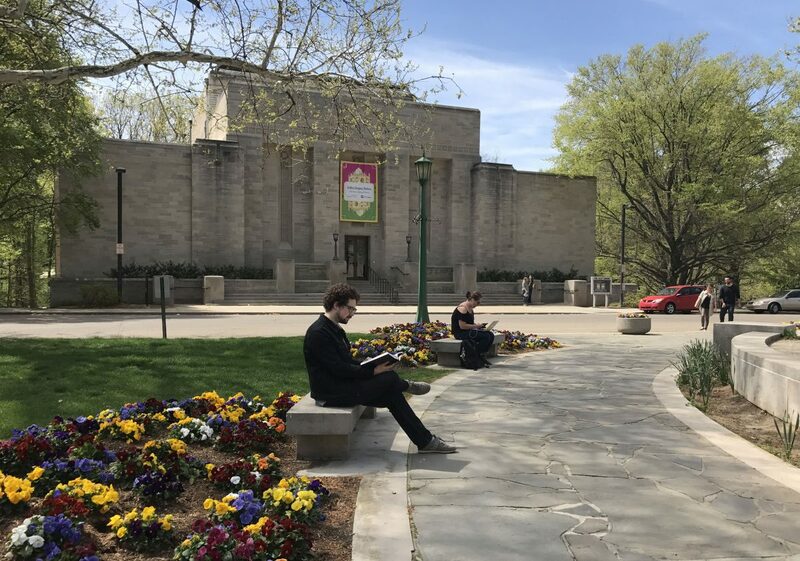 The paintings joining the Lilly Library’s collections are water colors, gouaches, and crayon on paper, ranging in size from 4×6 inches to about 12×15 inches. Some of the works are even smaller, for they are rendered on 3×5 U.S. Government stamped postcards; Odets was a philatelist and knew that the cards were made of suitably archival paper. The style is naïve and strong with intense color and imagination. Odets was clearly influenced by the artists whom he himself collected; he owned works by Maurice Utrillo, John Marin, Wassily Kandinsky, and Paul Klee. Odets first exhibited his own works on paper at the J.B. Neumann Gallery in New York in 1947 and continued creating art until his death in 1963. 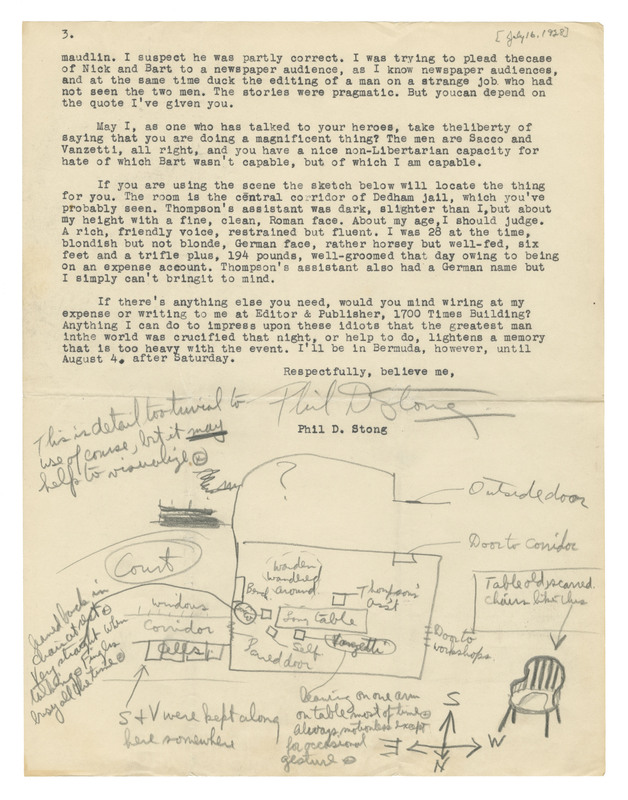 The addition of Clifford Odets’ art to the Lilly Library’s manuscript holdings will allow researchers, students, and aspiring artists to explore and understand the complex ways in which creativity develops over time and across multiple mediums. We wish to extend our deep gratitude to Walt Whitman Odets for this generous gift. Dr. Odets is a practicing clinical psychologist with a background in photography and aviation. He chose the Lilly Library as the beneficiary of this extraordinary collection due to the “mid-western spirit of openness that welcomes” everyone to use the collections. We are proud to continue that tradition! You can explore the Lilly Library’s extant Odets holdings here.